We’re big fans of the unusual and the unique. If it happens to be taboo, too, then all the better. 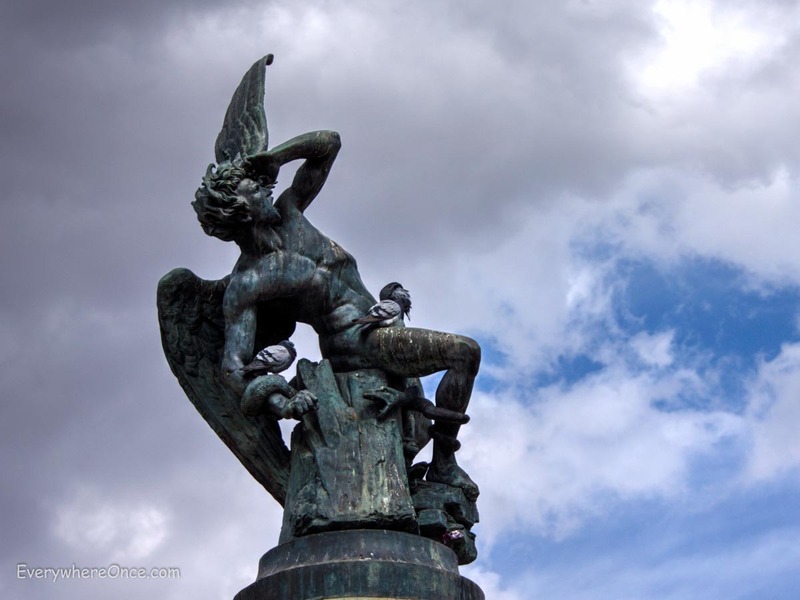 As one of the only public tributes to Satan anywhere in the world, Fuente del Ángel Caído (Fountain of the Fallen Angel) in Madrid’s Buen Retiro Park scores on both counts. Rising an appropriate 666 meters above sea level, the statute of an angel bound by a snake, hair seemingly ablaze, falling backwards from the heavens is a striking sight. Even more so when the clouds cooperate the way they did on our visit. But when our camera unexpectedly failed while shooting Lucifer, we decided we had lingered long enough. ← What is it with Waterfalls? Yet another well captured image. But no comments… from more 7000 followers of your entertaining and informative blog. Uncomfortable with the subject matter perhaps? I had the same idea. Apparently no sympathy for the devil here. ps. Is the camera ok? It seems to be. That was the one and only time it failed on me. Spooky.